The What: At its InfoComm booth (C5124) Altinex will introduce the new MT302-201 Digital Multitasker. 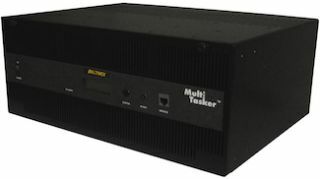 Designed as the foundation for providing advanced Audio Visual Systems capabilities in today’s sophisticated AV environments, the MT302-201 Digital Multitasker is a 4-RU, rackmountable chassis that offers advanced AV system configuration options that are controllable using either a network or wireless setup. The What Else: The new Digital MultiTasker is controlled using TCP/IP commands or via an easy-to-use, web-based interface. The unit’s front panel has an LCD to display essential information about the system and the cards installed—including the IP address of the MultiTasker on the network. The MultiTasker utilizes a simple ASCII-based command set to control the individual cards installed inside the enclosure. Individual cards are referenced using their slot number as a unique identifier. As the foundation for as many as 20 Digital MultiTasker cards, this enclosure has several cutting-edge cards available for use with the system. These include the MT312-104 Control Card, the MT305-804 8×4 HDMI Matrix Switcher, the MT315-101 HDMI Over Anywire Transmit Card, the MT315-102 HDMI Over Anywire Receive Card, the MT317-101 HDMI Over Fiber Optic Transmit Card, the MT317-102 HDMI Over Fiber Optic Receive Card, and the MT310-104 16×16 Stereo Audio Matrix Switcher. Additional options for the system include the MT399-101 Enclosure Rack-Mount Bracket Kit and the MT399-105 5-Piece Multitasker Card Slot Blanks for creating a clean, streamlined appearance over unused/open slots. The Bottom Line: The MT302-201 supports up to 20 Digital MultiTasker cards and is equipped with two ethernet ports, an IR receiver/IR blaster, and an LCD front panel. Control is accomplished through a computer, a control system, or any device capable of establishing a standard TCP socket to the MT302-201’s IP address.